The Emmys snubbed Atlanta in its major categories in 2018, Blackish didn’t receive any nods at the Golden Globes for 2019, and Queen Sugar still isn’t getting the kind of recognition it should. But there was undoubtedly some black excellence on your television screens this year. 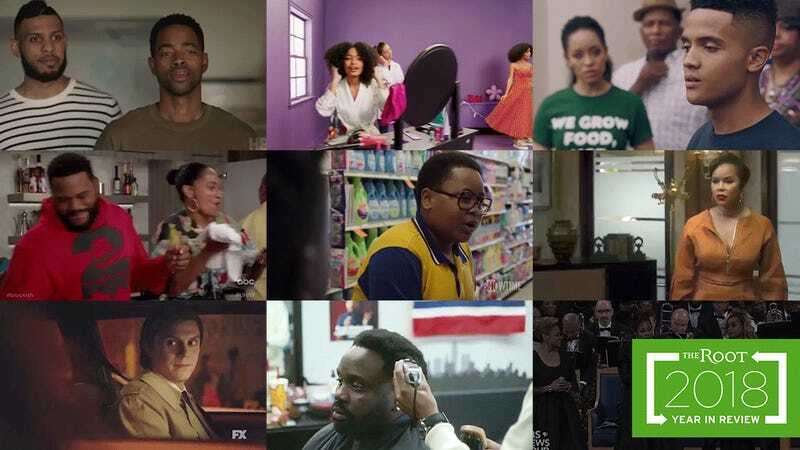 From LeToya Luckett’s conniving ways on Greenleaf to Shamon Brown Jr.’s wiser-than-his-years words for his teenage friends in The Chi, The Root looks at 10 of the best performances and moments from black television in 2018. 10. Grown-ish pays homage to A Different World. As Grown-ish gears up for its second season, premiering on Jan. 2, 2019 on Freeform, the network released a perfect ad to promote the show. No, Queen Aretha isn’t belting out the theme song from The Cosby Show spinoff, and no, Zoey (Yara Shahidi) doesn’t go to a historically black college. However, with Chloe x Halle singing Grown-ish’s theme song “Grown” and Zoey and her friends studying, protesting, taking selfies, and sippin’ out of red cups, this homage to A Different World is a sweet tribute to one of the best sitcoms of all time. 9. The #LawrenceHive gets a surprise on Insecure. Man, the #LawrenceHive was mighty upset in 2017 when it seems as if Lawrence (Jay Ellis) had given his last performance on HBO’s Insecure. There was a lot of Twitter ranting and petition-writing ahead of the third season premiere to make sure that Issa’s ex would return. Issa Rae responded to the petition, which was a sponsored post on Facebook, with a bit of incredulity that anyone would pay money to demand her to … do anything. So it came as a huge surprise for many when in the fifth episode, titled “High-Like,” Lawrence appeared at the tail end of the episode. Perhaps the best part of Lawrence’s return is that so many of us thought it was a wrap for Issa’s ex—and that everyone kept his reappearance under wraps for a nice surprise. 8. Regina King taps into a mother’s pain in Seven Seconds. Regina King gave an epic performance in Netflix’s limited series Seven Seconds. She has already earned an Emmy Award for her performance and could nab a Golden Globe Award for the role in 2019. In Seven Seconds, King portrays Latrice Butler, a mother whose son was run over by a police officer. Her son, Brenton, survives the hit-and-run for a moment, and is in a coma through the second episode. It is King’s grief-stricken response to the news that her son had died while she stepped away from his side that truly shows her immense talent. In Vanity Fair, King revealed that writer Veena Sud and director Jonathan Demme were hoping that she would tap into a quiet pain in the scene—and King certainly delivered. 7. Nicholas Ashe delivers powerful speech about policing and incarceration on Queen Sugar. 6. Black-ish’s 100th episode was dedicated to Prince. On ABC’s Black-ish, when Jack and Diane don’t immediately fawn over the genius of Prince—let alone know who he is—Bow and Dre work overtime to teach the twins about the High Priest of Pop. Throughout the episode, which is the 100th of the series, the Johnson family gives us several musical tributes to the legendary artist. Diane (Marsai Martin) stuns as she sings “Purple Rain” in the iconic metallic purple suit, with the ruffled white shirt; Ruby (the incomparable Jenifer Lewis) performs “When Doves Cry.” But it’s the family’s singalong to “Nothing Compares 2 U” that really gives the episode the gravity the Royal Badass deserves. 5. Shamon Brown Jr. schools his friends about tampons in The Chi. 4. LeToya Luckett killed it as Rochelle Cross in Greenleaf. If you haven’t been watching Greenleaf on OWN, trust me, you’re missing out on some of the best gossipy, church drama that’s ever been on TV. The series is on its third season and has truly reached its stride, especially when Rochelle Cross, resident cryptocurrency hustler and wannabe first-lady-in-waiting, graces the screen. Portrayed convincingly by R&B singer and actress LeToya Luckett, Rochelle is at the center of a scheme to destroy Bishop James Greenleaf’s church—and his marriage. Who knew a child of destiny could have a heart full of vengeance? 3. Pose perfectly showed us ballroom culture in living color. FX’s Pose, a 1980s New York City set drama focusing on the lives of queer men and women of color, was one of the most talked about series of the year. The series had several history-making moments this year: Janet Mock became the first transgender woman of color to write and direct a TV series. The cast is the largest assembly of trans actors for a scripted television series. The series made history again in December when it was nominated for the Golden Globes Awards, becoming the first mostly trans cast to nab a nod. In “Love Is the Message,” directed by Mock, Pray Tell (Billy Porter) delivers a Golden Globes-worthy performance (he was nominated for best actor in a drama series), as he grapples with an HIV-positive diagnosis. He and castmate Mj Rodriguez sing a stirring rendition of “Home” from The Wiz. 2. Aretha Franklin funeral was a must-see TV event. OK, so no—Aretha Franklin’s funeral was not a TV series with a dramatic or comedic plot, at least not in the traditional sense. However, the Queen of Soul’s homegoing—which lasted eight hours!—was definitely one of the most memorable television events of the year. The Clark Sisters, Shirley Caesar, Fantasia and Jennifer Hudson all brought the house down singing classic homegoing songs. Author and professor Michael Eric Dyson gave a very wordy rebuke of President Donald Trump. But there were, of course, several missteps. Rev. Jasper Williams Jr. gave a truly terrible eulogy, and Bishop Charles H. Ellis III got in hot water for inappropriately touching singer Ariana Grande and comparing her name to an item on a Taco Bell menu. Despite the few fails, Franklin’s homegoing service was a true testament to the power and grace of one of the world’s greatest singers. 1. Atlanta’s “Barbershop” episode was almost too relatable. Yes, the “Teddy Perkins” episode of Atlanta was a masterpiece, but episode 5 of the season, “Barbershop,” also showed a level of quiet genius that audiences also appreciated. The Emmy-nominated episode, written by Stefani Robinson, turned the routine practice of getting a haircut on its head and added those all-too-familiar holdups and mishaps that often happen in a barber’s chair. FX’s Atlanta truly shows its brilliance through two phenomenal performances in this episode, with barber Bibby (Robert Powell) making absurd requests and taking Paper Boi (Brian Tyree Henry) on a journey that even the most reliable customer would decide to change barbers, perhaps to his own hairline’s demise.